I consider myself very fortunate and extremely proud to lead teaching and learning in my role as Deputy Headteacher, however, that’s not to say that leading teaching and learning isn’t everybody’s responsibility, because it is. And herein lies many potential pitfalls and of course golden opportunities for leaders like myself to either grow a culture and ethos of shared accountability, collaboration, risk-taking and high challenge or destroy it through an imposed draconian approach of how it ‘should’ be done, usually spear-headed by a ‘hero’ leader. A: Clear structures are in place underpinned with a fair and aspirational teaching and learning model. Opportunities are created frequently for all teaching staff to talk formally and informally about teaching and learning. CPD is fluid and informed, addressing not only whole school priorities but also meeting the diverse developmental needs of all teaching staff. Wellbeing sits at the heart of teaching and learning and the focus is very much on development rather than judgement. However, this is not to say that expectations and challenge aren’t high, they absolutely are and everybody realises that judgement of teaching and learning is still made at a whole school level. Teachers aren’t told how to mark or how often to mark, quite simply they use the wealth of strategies they feel appropriate to intervene timely to accelerate learning gains and progress of all students. Lesson observations and ‘learning walks’ are open to anyone to contribute to ensuring typicality and looking at the big picture over time is achieved. Trust thrives. B: Very tight structures are in place, including a very prescribed teaching and learning policy. 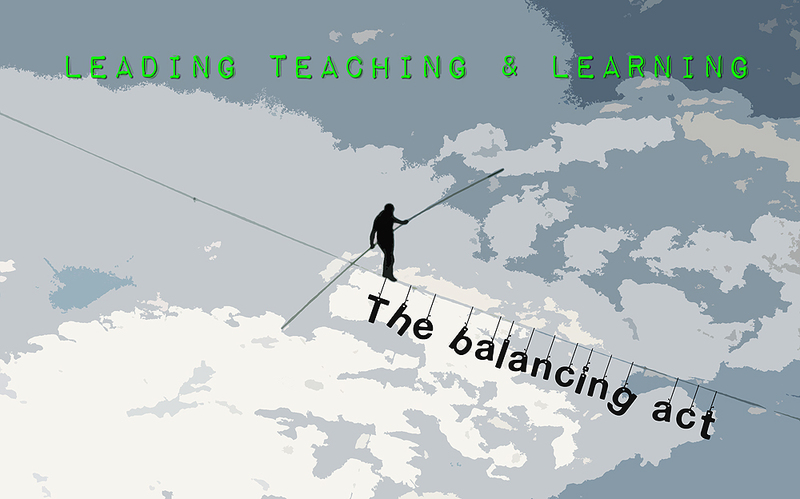 Opportunities to talk about teaching and learning are limited, but do happen occasionally. CPD addresses whole school objectives but lacks personal pedagogical development opportunities, meaning teachers aren’t reflective practitioners. Strict monitoring of teaching and learning takes place through Ofsted style ‘reviews’ of departments/subjects/teachers, usually carried out by the leader of teaching and learning to check up on teachers and hold them to account against nonsense policy around marking and lesson observations. Wellbeing isn’t considered when carrying out such draconian measures and morale is low. Trust is absent and a compliance culture exists. Nonetheless, both of these approaches will underpin student progress and ensure the teacher standards met, however, I certainly know which one I’d rather be a part of! 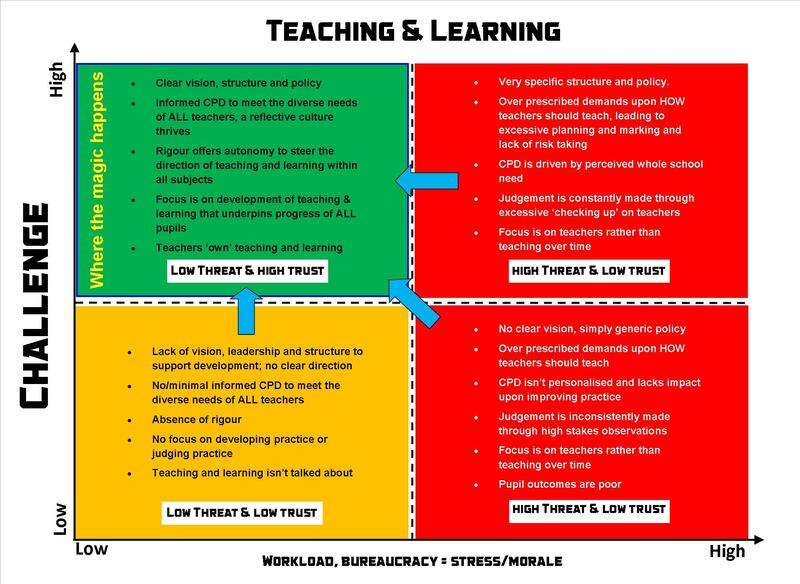 For me, leading in the green quadrant is the aim, where teachers thrive in a high challenge environment, accountable to each other as well as the teacher standards and a culture where teaching and learning is frequently talked about, explored and best practice shared through an ethos of reflection, you can read more here about this in a previous blog. This will only happen when the culture is of low threat and high levels of trust are built over time, all part of the balancing act of accountability, fairness and doing what is right for all teachers and students in your own particular context. Keep things simple and focus on the main thing – that is teaching and learning, create time for all staff to talk about this. Consider what you can take away from meeting schedules and other workload heavy administrative tasks to make this happen. Ensure that CPD is informed through triangulated evidence over time to meets the needs of all teaching staff. Don’t be a hero leader and don’t impose what you perceive to be ‘the way’ to do things – take time to collaborate with colleagues in other schools, listen to your own staff and explore the alternatives. Do not insist on what you believe to be the correct way of doing things and thrust this upon everyone. Also, be mindful of ‘out of the box’ models you have acquired from other schools, as every school is different and you need to personalise your approach for the context of your own school. Keep standards high and be clear and consistent about expectations – once you’ve agreed a sensible policy for teaching and learning and created a realistic quality assurance process (mindful of the workload burden), use it and don’t keep moving the ‘goal posts’. This creates shared accountability. Focus on teachers as individuals and not simply units on a spreadsheet – I’m a believer in a flat leadership model and I’m most certainly not a ‘top down’ person. I simply have the title of Deputy Headteacher because I am more accountable and responsible than others, but not as much as the Headteacher! On a human level we are all the same regardless of our role within the organisation, so get to know everyone because we are all different, all have our own unique skillset and we can all make a difference. Just this week I start my new role at Isca Academy and I shared this on my very first training session with all staff. I believe this should trigger conversations that need to take place in schools up and down the country – How can we maintain rigour and make the shift to a formative teaching and learning culture? Have a wonderful year in what I can only describe as the best job in the world, keep teaching and learning the main thing and do what is right for your students and staff in your context. Excellent read. My school used to be in the green, unfortunately with change of leadership, we have moved to the yellow!